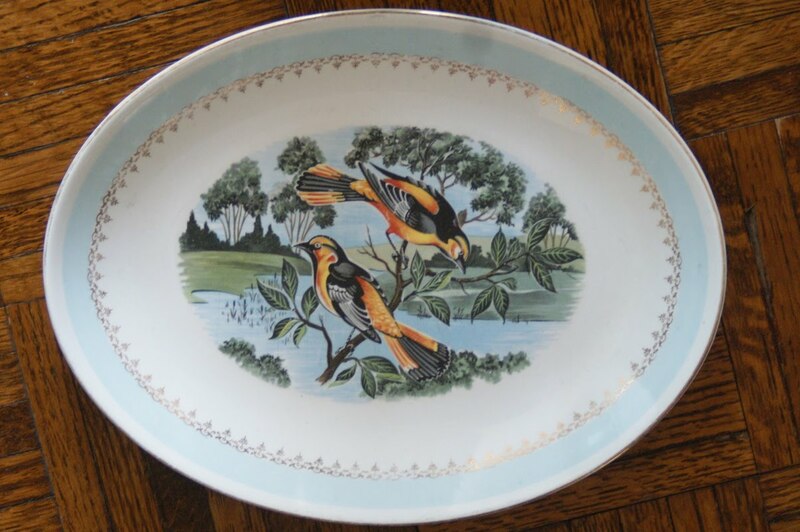 When I paid $1 for this Homer Laughlin platter at a thrift shop during Christmas shopping, I fully intended on giving it away, but then it started to grow on me. Maybe it's because of the birds that remind me of my mom. All winter long, Mom keeps the bird feeders full, welcoming all kinds of feathered friends to rest a spell in her backyard. Or perhaps it's the delicate gold trim that runs around the edges of this piece, reminding me of the the mix-and-match china that my Grandma Churchill used to pick up at old country auctions. None of my Grandma's thrifted china matched, but with pieces that came from far away places like France and England, each one seemed like a rare treasure even if it had been salvaged from a box jumbled odds and ends or plucked from pile on top of a folding table. This cheerful pretty was hidden in the middle of a lowly stack of dishes, and when I pulled it out, I knew it was coming home with me to be covered in cookies and offered to someone else as a gift. But when I brought it, I couldn't seem to part with it. So at least for a little while longer, I'm going to keep it for myself. 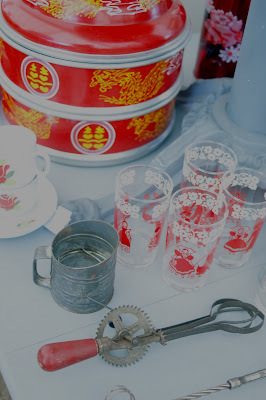 Have you ever bought a Gift of Thrift and then decided to keep it for yourself? Meet Bianca, the newest member of the Hooch Bag collection. She's a gorgeous, golden Whiting & Davis mesh number loaded with a nip of tequila, packed with candy cigarettes and full of funny money. A client asked her to be ready to roll at the last minute, so she got all pretty but then got left standing in the cold. And if you're wondering, she's available....for the right price! Reuse & Repurpose: What a Cut Up! A while back, I shared with you this Silverware Skyline that I saw in the windows of Fishs Eddy the other day, putting a whole new perspective on the way I look at New York, thanks to this Empire State Building made mostly of knives, a smaller, neighboring structure crafted out of spoons, and a Chrysler Building (not in this photo) made of forks and plates, all emulating the Manhattan skyline in flatware! 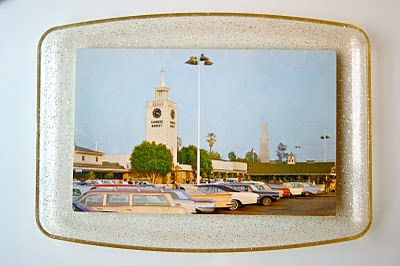 I am always on the lookout for unused postcards from places I've been -- especially if they're from eras that I've never experienced.Found at a thrift shop on the Jersey Shore, this little treasures features the Los Angeles Farmers Market. Based on the cars in the parking lot, I'd say this photo was taken in the late 1950s or early 1960s. 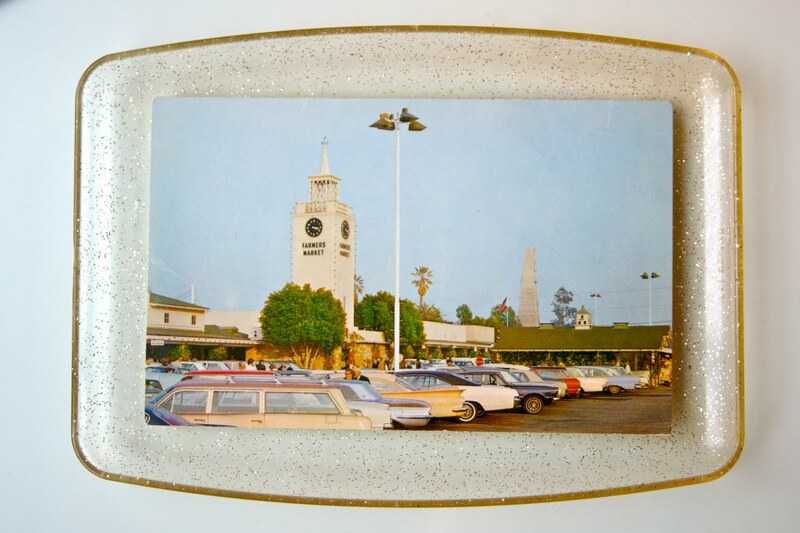 And since it's one of my very favorite places to dine -- especially with my LA garage sale pal Ruth Handel -- I decided to send this card to Ruth. But before I posted it on its way from New York to California, I photographed it atop this glittery plastic tray that I found on the same trip. It came in a set of 12 at a church rummage sale and set me back a whole 25 cents. Yesterday, I talked about how a single color can unify a vignette. Quite the opposite can also true. In The Find: The Housing Works Book of Decorating With Thrift Shop Treasures, Flea Market Object, and Vintage Details, we also discuss how the lack of a hue can emphasize cohesiveness among what at first glance might appear disharmonious in shape or size. I took this photo at the farm house of a friend who lives in New Jersey. She gathered all her clear glass decanters, varied them by height and displayed them atop her pink fireplace mantle for a focal point that when the sun hits them just right is as shimmery as the Manhattan skyline. On a frigid winter's day like this one is, I like to look through images that remind me that summer will come back -- bringing with it the season of garage sales and flea markets. I took this photo a while back when I spent a few days with LeAnn Stephenson, The Vintage Laundress, in her booth at the Texas Antique Weekend. This picture stands out for the way it demonstrates how color can unify dissimilar objects. By choosing this bright hue as her common thread, LeAnn easily merchandised gleeful, printed glasses and a red-handled Americana hand mixer with a container used to steam Chinese delicacies. Remember when I told you about the Prada bag found in my compactor room that blew my mind with the treasures it contained? Among its contents were several made-in-USA Homer Laughlin serving platters -- more than I could ever use unless I opened a catering business -- and this pair of Michele Harvey coffee cups. Now the coffee cups have gone out the door as a belated Christmas gift, yet another found object that will hopefully become another person's treasure. Even though I'm not a seeker of snow, I couldn't resist these whimsical flakes falling in the windows of a shop called Journelle just off of Union Square. What makes these snowflakes even more appetizing is that they are made of cupcake liners -- the kind that come with a foil exterior allowing them to be baked on a cookie sheet rather than a muffin pan. While the silver and white snowflakes dance gracefully above the window display of lingerie (really nice lingere -- but you can use your imagination), the accumulation of this sweet, snowy stuff builds at the bottom. I always love the double-discovery of finding a thrift item at a garage or an estate sale, and then all of a sudden remember it after its been taken home and put away. As you know, I love to bake, so for a friend's birthday, I decided to whip up the coconut cake from Magnolia Bakery 's cookbook filled with recipes that for me, always seem to be a success. But when it came to serving this mound of white goodness, I couldn't decide on the right platter. I had a yellow, ruffled pedestal that I bought at Crate and Barrel several years ago or a plain, clear option, which would have looked nice against the white coconut. 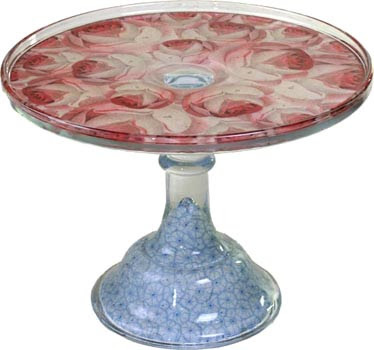 I was leaning toward using the my treasured, decoupaged John Derian pedestal, pictured above, until I was struck with an idea. I remembered a 1970s piece I paid $1 for at an estate sale in Independence, Missouri, that had never been used, and now seemed like the right moment for its inauguration. I especially love how the festive message is slowly revealed as the cake starts to disappear from the platter. The Find: Fun for Kids! A few weeks ago, I helped my sister put together my nephew's birthday party at a local bowling alley. We looked all over for inexpensive, thrifty bowling decor, and sort of struck out -- and not in a good way. 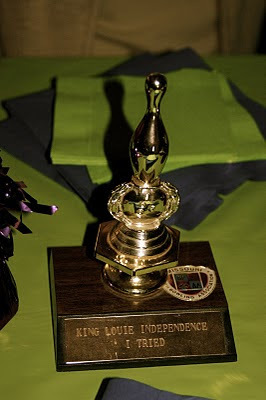 But as my sister was looking through some of her childhood mementos, she found this trophy that we used as a centerpiece for our tabletop display. We each received one of these bowling-pin-topped awards after taking bowling classes one summer while in grade school. We had lots fun, that's for sure. But I don't think it was a talent in which we really excelled. But as the engraving reminds, we did try. Yes we did! Isn't that about the best you can ever do? I'm always amazed at the treasures people just toss out, with no effort to give them to someone who will appreciate them or donate them to a charity! A while back, I told you about the Prada bag found in my compactor room that blew my mind with the treasures it contained. Among its contents were several made-in-USA Homer Laughlin serving platters -- more than I could ever use unless I opened a catering business. Over Thanksgiving, a friend told me she had no serving platters to use when her family was in town, so when her birthday rolled around, I realized I already had her gift. Since I'm dedicated to using what I have for gift wrap and cards, I covered these platters in shiny, paisley paper, since I didn't have the proper box, and tied them up in a brown, grosgrain ribbon. So she would have something to carry her gifts home, I put my offering in repurposed a felt bag and placed a homemade birthday greeting in its pocket. Have you ever turned a found object into a Gift of Thrift? 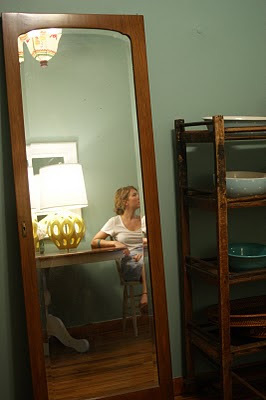 If you're looking for a unique mirror, thrift stores are filled with reflective solutions, even if they were never meant to be framed and hung on a wall. When New York's Taryn Cardin got tired of not being able to see herself in a full-length mirror, she headed off to her local Housing Works where she found a door from a discarded armoire that did the trick. Before you think I've totally lost my mind -- and all semblance of taste -- I'm not necessarily endorsing this decor. It's just that every time I look at this photo, I can't help but laugh at almost every single element in the frame. It's hard to believe that I found this kitschy little green room a few years back when I was doing a fashion shoot at a glorious, mid-century home in the Hollywood Hills. As models posed by a chic pool overlooking Sunset Boulevard, I slipped into the restroom to snap this image. Not only did the decorator use wallpaper in the space, but she also added lime shag carpeting and accented it with framed plants stitched in relief, which are hung by plastic 1970s floral posts that coordinate perfectly with a handy room deodorizer. I don't know, but I don't think the light fixture works. Do you? A chilly day like today reminds me of warm destinations, such as the Palm Springs home of Jim Moore, GQ's creative director. The most lovely aspect of this house, which was photographed by Bob Greenspan for The Find: The Housing Works Book of Decorating With Thrift Shop Treasures, Flea Market Objects, and Vintage Details, is the simplicity with which it honors its Mid Century heritage and Moore's knack for decorating with vintage and thrift. 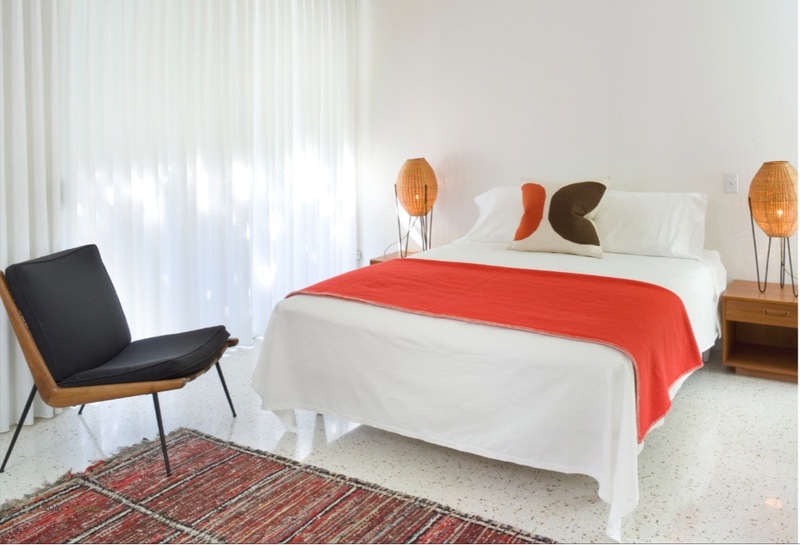 This bedroom is a perfect example of combining old with new. The woven lamps were discovered in a tony, Parisian antiques shop and sit atop two wooden side tables that Moore picked up in a local Palm Spring thrift shop for $25. A bright Jonathan Adler pillow and an orange throw adds interest to the bed, while a Danish Modern chair rests near a colorful, braided rug. If you have a copy of The Find that you wold like me to personalize, email me your information and I'll mail you a bookplate created just for you! My sister certainly knows how to give a great Gift of Thrift. When I go to a garage or an estate sale, I always try to have in the back of my mind the certain people I know would love a thrifted gift. I find that when I do, the results always amaze and impress. Obviously, I'm on my sister's thrifty gift list, and she never fails to find treasures that seem to have been tucked away just for me. She knows I love to entertain at home, and even though my table settings are far from extravagant, I do like to use cloth napkins and wrap them up in appropriate rings, such as the ones she boxed up and presented under the Christmas tree. And as you know, I love a vintage cookbook exploding with Technicolor photos of long-lost dishes just waiting to be resurrected in -- my kitchen. Now how could one pass up this golden, commemorative edition of the Better Homes and Gardens New Cook Book ? What's more, it's from the fall of 1964, which I can assure you was a very good time of year! 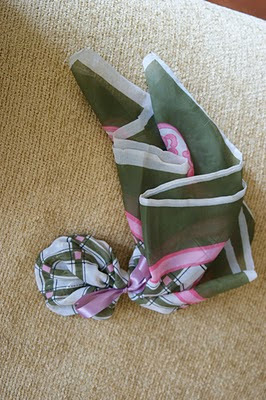 Reuse & Repurpose: All Wrapped Up! During gift-giving season, I made it my resolution to wrap gifts with what I already had on hand And since I was getting low on -- and already tired of -- all the Christmas paper, I used a vintage scarf to present a metal belt to a friend. 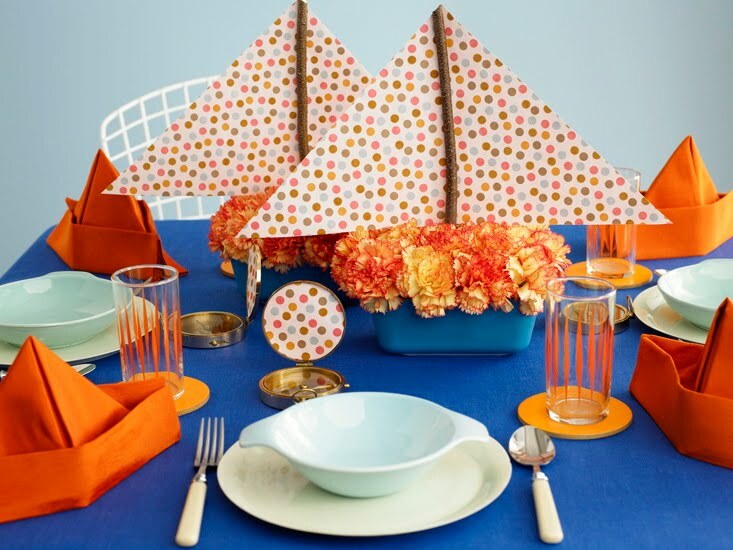 I tied it up in a bow from a box that I purchased at an estate sale, and came up with a presentation that could be used almost any time of the year. Frugal Fun: It's a Strike! 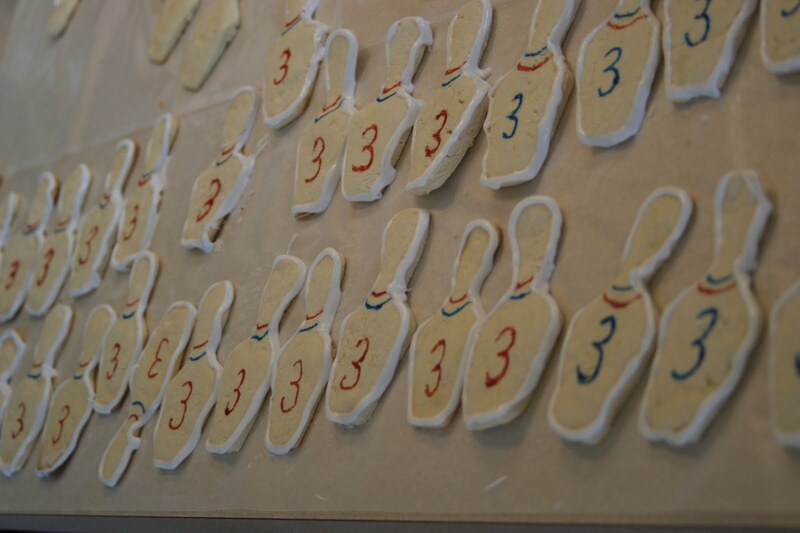 For my nephew Grayson's third birthday, my sister chose a bowling alley on the historic Independence, Missouri Square for the location, and I was charged with making all the baked goods to roll with the theme. My sister wanted cupcakes, so I turned them into bowling balls with brightly colored frosting and three chocolate chips to emulate the finger holes. 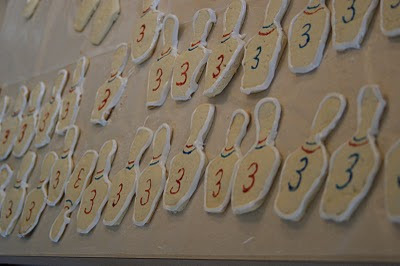 And as a parting gift my mom and I made sugar cookies decorated shaped like bowling pins. Since we didn't have time to find the correct shape of cutters, my sister's husband made one by bending a piece of one-inch-wide flat metal into the shape we needed. Mom and I then cut them out, baked them, and got to decorating them with the age of the birthday boy -- three! 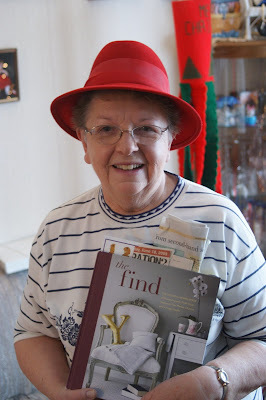 I met Eleanor Park back in the summer of 2009 when I launched The Find: The Housing Works Book of Decorating with Thrift Shop Treasures, Flea Market Objects, and Vintage Details at Luticia Clementine's on the Historic Independence Square. A member of the same church as my mom, she recently asked me to stop by her Independence, Missouri home to show off a few of her own treasures. Gathered here are just a few of her garage-sale finds: a group of crocheted nut cups and tiny appetizer forks that she uses for at-home tea parties. 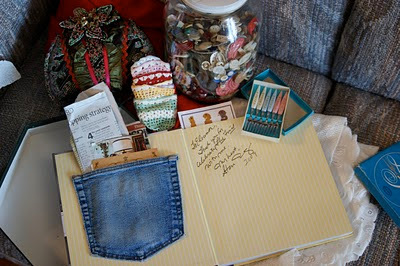 They're sitting alongside a jar of vintage buttons that she says were inspired by The Find. I was also surprised to see how she repurposed an old pair of jeans by taking its pocket and gluing it into the book's cover to save clippings about The Find. Remember, if you have a copy of The Find that you'd like personalized, email me your address at theelegantthrifter@gmail.com, and I'll mail an inscribed bookplate right to your door! Kansas City is full of architectural charm, and here are two historic centerpieces that I've visited since I was a kid growing up in Independence, Missouri. I took these photos from my spectacular view on New Year's Eve in my corner room in the 1970s-fab Crown Center Hotel -- now a Westin property. Union Station, above, built in 1914, reached its peak in travel history during World War II. I remember visiting the station in high school and looking for the bullet holes allegedly left in the wall during the 1933 Union Station Massacre where legendary mobster Frank Nash was gunned down. Renovated in 1999 and now a tourist destination, the building glimmers on into a new century, celebrating the glory days of train travel. Right across the road is another revitalized site -- The Liberty Memorial, which is the only World War I museum in the United States. 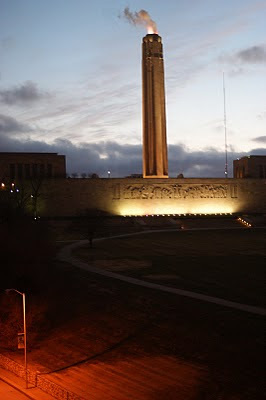 I remember going to its top when I was in third grade on a field trip to Hallmark's Crown Center. It closed in 1994 because of disrepair. It was then renovated and reopened 10 years later, and now stands proudly as a much-loved marker among the Kansas City skyline.